About Us - Fundación Yepez A.C.
We are part of a group of leaders focused on the preservation of the sea turtle for the past 50 years, beginning to generate a transformation process in the world as well as in its ecosystems. the actions we carry out are designed to benefit the 5 species of sea turtles that arrive on our coast to nest each year, as well as their habitat both on land and in the ocean. Our goal is for the species to prevail on this planet for generations to come. The founders of this project started saving sea turtles on the north coast of Veracruz in 1967. The fisherman Marcelino Yepes together with his wife Librada Gerón Dominguez, dedicated their lives to protecting, conserving and investigating the endangered sea turtles. Thanks to their enormous effort and struggle to save them from extinction, it is possible for us to still have the opportunity to receive so many nesting female turtles of different species on our beaches. Their eldest son , Ricardo Yepes, decided to continue with their legacy of 50 years of sea turtle conservation and founded Fundación Yepéz - (the Yepez Foundation) both in honor of his parents and for future generations. Founding Director of Fundación Yepez A.C. 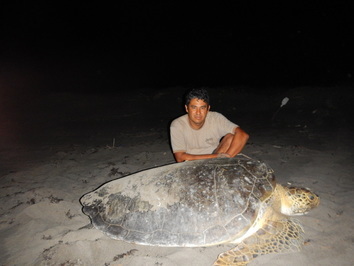 The director, Ricardo Yepes Gerón, worked with sea turtles his entire life, side by side with his parents. After the passing away of Don Marcelino he made the decision to continue with the legacy together with his mother and siblings and dedicates his life to saving this species from extinction. Ricardo Yepes is also the president of the Local Comittee of Clean Beaches of Nautla, Tecolutla and Vega de Alatorre, proudly achieving the first "Blue Flag" conservation beach on the Gulf of Mexico.